H. Rick Bamman - hbamman@shawmedia.com legally blind swimmer with the Crystal Lake Central co-op swim team Makayla Nietzel will train for the U.S. Para Olympics swim team. H. Rick Bamman - hbamman@shawmedia.com Crystal Lake Central's co-op swim team member Makayla Nietzel swims in the Sage YMCA pool. 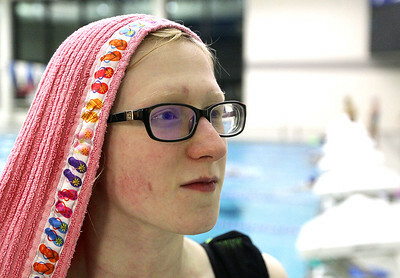 Nietzel, who is legally blind, will train for the U.S. Para Olympics swim team. H. Rick Bamman - hbamman@shawmedia.com Crystal Lake Central's co-op swim team member Makayla Nietzel and her mother Terry Nietzel adjust her swim goggles before a recent practice. Nietzel will be training for the U.S. Para Olympics swim team. Nietzel is legally blind. H. Rick Bamman - hbamman@shawmedia.com Terry Nietzel mother of Crystal Lake Central's co-op swim team member Makayla Nietzel coach Ed Richardson discuss training for the U.S. Para Olympics swim team. Makayla is legally blind. 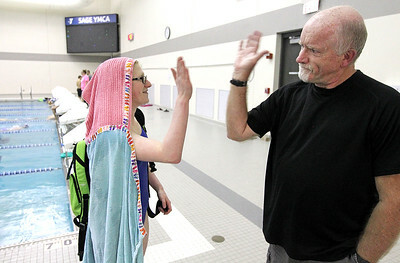 H. Rick Bamman - hbamman@shawmedia.com Legally blind Crystal Lake Central co-op swim team member Makayla Nietzel and coach Ed Richardson high five after a practice session at the Sage YMCA in Crystal Lake. Nietzel has been invited to train for the U.S. Para Olympics swim team. 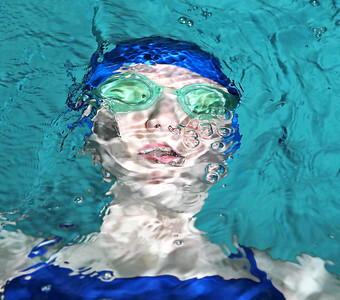 Crystal Lake Central's co-op swim team member Makayla Nietzel swims in the Sage YMCA pool. Nietzel, who is legally blind, will train for the U.S. Para Olympics swim team.